Another week, another game with the odds favoring the Seahawks to win a football game on the road. Many football odds predictions have the Seahawks winning. Others, like SportBet News, are taking the Colts and the one point. My first step when familiarizing myself with a Seahawks opponent is to find their relative statistical strengths and weaknesses. Researching the Colts led to some surprising results. Notice anything? These two teams are nearly identical in every category. That is not normal. 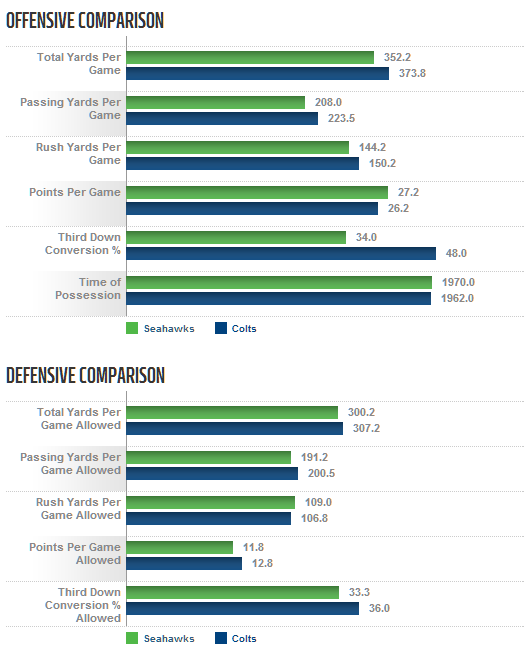 I don’t know if it is more surprising that a Seattle offense that has yet to find a rhythm is neck-and-neck with a Colts offense that is playing pretty darn well, or that a Colts defense is even with a Seahawks defense that has played fantastic football thus far. A few things caught my eye. Indianapolis is rushing for more yards per game and at a higher average per carry than Seattle. Digging in a little deeper, those yards are coming in a very distributed fashion. Ahmad Bradshaw and Vick Ballard are out with injury. That leaves Andrew Luck as the leading rusher heading into Sunday’s game. The Trent Richardson deal got a lot of headlines, but I can’t say Richardson has ever wowed me in the NFL. He’s always been a low YPC guy, and that has not changed in Indy. He had 20 carries for 60 yards in Jacksonville last week. Still, the Colts wound up with 157 yards rushing thanks to 65 yards on 3 carries from Donald Brown and 26 yards on two carries for Luck. That is how a team ends up averaging 5.2 YPC when their top back averaged 3.0 on 20 carries. This is a team that has rushed for at least 127 yards in each game so far, including 184 yards in San Francisco. Seattle has not won 10-7 in San Francisco the past few years, let alone 27-7. An accomplishment like that deserves respect. But that is the only decent football team that have beaten so far. They beat the Raiders at home by four points, lost to the Dolphins at home, and beat the Jaguars on the road. Their only loss came in the one game where they did not win the turnover battle, and the only game where they did not have at least two takeaways. That is an area Seattle needs to return to their 2012 form. The Seahawks did not have a turnover in four of their last eight games last year, and had only one turnover in three of the others. Going seven of eight games with no more than one turnover is exactly what Pete Carroll wants to see, but the team has had two turnovers in each of the last two games, and one in every game so far. This would be a great game to start protecting the football more. Indianapolis does not feature many household names on defense. Even Robert Mathis is not a guy that the casual fan would have heard of. Watching their tape makes it clear they are being coached splendidly. Offenses have struggled to sustain drives, leading to the second-fewest red zone opportunities surrendered per game. Teams that do find their way to the red zone against the Colts score a touchdown 75% of the time, 29th in the NFL. Taking a step back, the Colts look like a very efficient football team that will not beat themselves. Luck is the best quarterback Seattle has played this season, and he has the intangible skills that allow him to respond to adversity productively the way a guy like Colin Kaepernick may not. They are a worthy opponent that will not be intimidated by the Seahawks. That said, this team presents none of the match-up nightmares the Texans did a week ago. Mathis, even with his gaudy sack numbers, is an edge rusher. He will not physically overwhelm players, and can be double-teamed. J.J. Watt blew up the whole line of scrimmage, and guys like Brian Cushing and Antonio Smith were more disruptive than anyone the Colts can line up. Seattle is due back Max Unger this week, and Michael Bowie will have had a week-and-a-half of game action heading into this one. The offensive line needs to be good enough. They need to be able to run, and if they ran last week against that Houston front seven, there is no reason to think they won’t run against this team this week. Luck is the wildcard, but he is yet to face a secondary anywhere near as talented as this one this year. The Colts have some nice pieces with Reggie Wayne and T.Y. Hilton, but what happens if Wayne gets put on ice? The Colts receivers are going to struggle to find space. Luck is good enough to create opportunities, but he is also susceptible to interceptions. I don’t enter this game with any certainty that the Seahawks will win, but I will be surprised if they don’t. As much as we like to build up every game, every week, this game is not that crucial in the grand scheme of things. It is probably the difference between going 9-0 or 8-1, and could help in a tie-break situation when records against like opponents can become a factor, but that is about it. This game is less about the Colts, and more about just how high Seattle wants to set the ceiling.